Hello Divi Nation! I’m excited to introduce our next installment of our weekly Divi Design Initiative. If you don’t know already, each week we give away a brand new, free Divi Layout Pack from our design team straight to you. And this week Kenny and his team have created a professional Photo Marketplace Layout Pack. 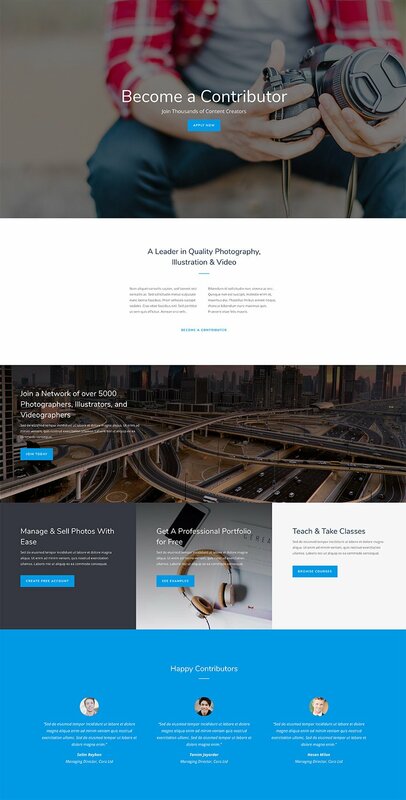 This layout pack includes 7 pages with everything you will need to create an online photo marketplace site in just a few clicks. This Photo Marketplace layout pack is designed to provide everything an average online Photo Marketplace will need out of the box. I absolutely love the Call to Actions (CTA’s) throughout this layout. You can tell some thought went into making them less cookie cutter and actually useful. This may not be a huge benefit for some, but I appreciate the actual copy used for the CTA’s throughout the layout. This makes it easier for users to tweak and make their own. I also admire the way images remain the highlight of the design throughout. The light backgrounds and simple layouts keep things super clean and non-destracting to viewers. To use the Photo Marketplace Layout Pack on your own Divi website, you will first need to download it using the button below. To gain access to the download you will need to subscribe to our Divi Daily email list by using the form below. As a new subscriber you will receive even more Divi goodness and a free Divi Layout pack every Monday! If you’re already on the list, simply enter your email address below and click download. You will not be “resubscribed” or receive extra emails. Once you have downloaded the layout pack, locate the divi-photo-market-layout-pack.zip file in your downloads folder on your computer. Double click the folder to unzip it and then navigate inside the divi-photo-market-layout-pack folder. Inside this folder you will find 8 files, each of which is a unique layout that you can import into your Divi Library. To do so, navigate in your WordPress Admin to Divi > Divi Library > Import & Export. You can select the individual layout you desire or choose the All Layouts file to important everything at once. We hope you enjoy this Photo Marketplace layout pack. And to help ensure that you do, we’ll be doing a live stream on our Facebook page this Tuesday at 3pm EST to walk through what it might be like to actually use this layout for your own website instead of simply importing it and loading it up. I’ll be going over how to setup multi-vendor marketplace functionality and more. You don’t want to miss it. Nice! these packs are all amazing. Will these all be available in the template library once it launches? Where is a template library located? How to search topic or something in Elegant Themes site? The Template library is being worked on and will come out when it ready. Nice work, as usual! 🙂 Thanks! Great job guys. Its neat, clean, simple and yet gorgeous! I love Divi as a theme full stop but the bonus layout packs are something else. “but the bonus layout packs are something else.” What exactly Roy? What are you missing on the Bonus Packs? Roy means it’s good. I don’t think Roy is “missing” something. I’m not saying this to celebrate myself. I’m saying this, because I want to learn something from you. I miss in your layouts that you show the full possibilities of the various tools and effects. Splitter, Color, Shadow, Frames, Animations, etc. All this is provided by DIVI, but not used by you to show us and make us better. I think that with this tactic you want to avoid that the so-called Premium Childs are not selling so well anymore. This is the wrong path, believe me. With DIVI you offer the most ingenious toolbox in the world. So please show it to us in action >> FINALLY ! Remember these are FREE and there for you to build upon. I agree with you, Eric. I was wondering g if Elegant Themes’ strategy is to not compete with their ecosystem and whether this could be the reason why ET examples and layouts and giveaways always seems half-baked and rarely show Divi’s serious capabilities and potential. 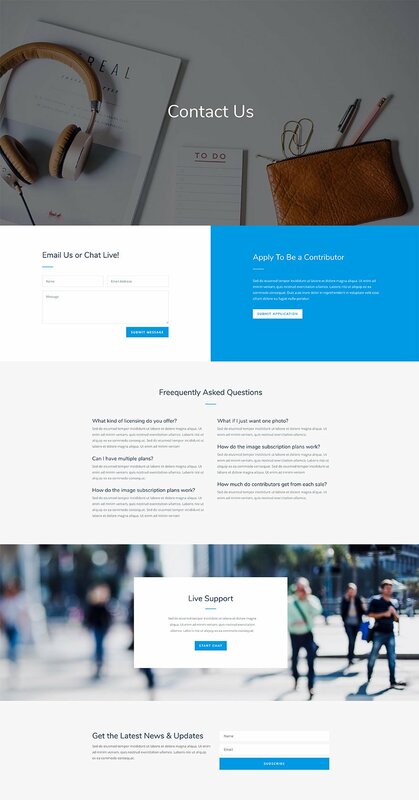 Anyway, I would really like to see more of good design and advanced features of Divi theme made and promoted by Elegant Themes. As a new subscriber and user of Divi, I can honestly say that what attracted me to Divi were external tutorials (on YouTube and on other people’s websites, where people generously shared their knowledge) and NOT on Elegant Themes website (which I found pretty bland and subpar – and this got me to think negatively about Divi before I found those other resources mentioned before). Contrast this to some software companies which actively create shirt videos and explainers, tutorials, and examples of best practice… (I’m not going to mention any one in particular here.) It would be good if Elegant Themes adopted similar strategy. I was sitting on a fence for a long time and the value I recognised came actually from wider community of Divi users and ecosystem AROUND Divi; Elegant Themes in itself didn’t make me feel like “wow”. I find it strange and hop e this honest feedback of a newbie would help Elegant Themes see things a bit better from our (newbie and new customer) perspective. Any thoughts on this, Eric and Elegant Themes and others? First of all, i think these free layout packs are excellent. Thank-you for providing them. As to Eric’s post about the layouts, the tools that Divi provides there is always an extensive tutorial on a new functionality tool when it is released and you can always look them up if you have missed them. Also, it is all about discovery and playing around with that new function. That way I always find you do not forget how to use that function. So, in a nutshell, I think it is best to uses sections of the layout than using the hole layout or having more functionality tools to the free layout as one section of this layout might fit in with the website you are building. I also have found that waiting for someone to teach you how to use their theme functionality or use CSS is a long process it is better for you to dig deep and find the info you are looking for that way your navigational skills around the web become better as well whereas you find things much faster. Bravo! I also find these packs really very basic, I would prefer to have even 1 per month, but at least that we can use it! 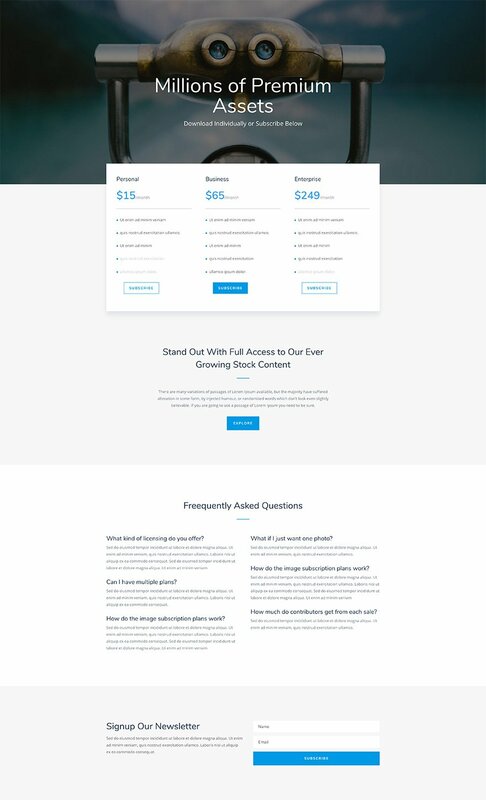 Elegant Themes’ layouts are much better than many, many, many Divi “designers” websites, and many “premium” layouts/child themes. The borders, margins, paddings, image selections, color palettes, and typographic choices are of professional caliber. Not everything should be animated (which is distracting, tacky, and annoying), nor should css filters be (over)used (compatibility). Will the live stream be available for later view? Is there a chance to watch that stream somewhere else after the live version? I won’t be able to participate it tomorrow, but I’d really love to see it later! I love divi. A fantastic ground breaking product. And the elegant themes really go out of their way to engage their customers. This theme/template is an excellent example. The only issue I have with these recent downloads is that they rely very heavily on a supply of excellent images. Most of my work involved projects where there is a limited supply of appropriate images on anything like the required level of quality. I would welcome some templates that maximises the impact of ‘poor images’. Tricky I know, but somehow part of the real world! This views are great. Artistic and catchy. Thank you! We are actually working on the new Divi Library which will include all these layouts. You can see a sneak peek of the new Divi Library on the following article from our Blog. How can you call that a photo amrket place ? Do you have any clue what a stock photography or even photography website should feature ? To me, this has just nothing to do with photo market place ! Yes, that’s what I found. Although greatly designed, it’s a superficial marketplace template, you have to do the core of it. The layouts are there to build upon and give you ideas. Awesome. Thanks. What is the title font used in this? Wow, fantastic, just phenomenal thank you, everyone! Also, few people have mentioned a custom WooCommerce matching layout. I forgot to mention you guys are Fantastic. Talk about over delivering and providing value. You should mention it on the landing pages for prospects when signing up for your service that this is included with the membership. This is a Great Bonus. I find it a better experience to view it on YouTube instead of FB. I notice the Woocommerce vendor plugin selected to use with the layout, is only using PayPal although you mentioned Stripe too. Are you able to do a tutorial showing how to tackle getting Stripe setup in a/the Marketplace, Paypal is far from the preferred payment method for professional use in my opinion, I would never suggest Paypal to clients! It kind of has a tacky ring to it!! bringing visions of eBay with it!! At least with Stripe customers stay onsite and remain focused on the website they are currently on and doing business with. Not sure about in the USA, after all PayPal is an American processor, but elsewhere on the planet, PayPal is not the preferred method. The Photo Market place design is exceptionally nice, Very classy. whoever designed it has done an awesome job on this. The Photo Marketplace is a great idea too, and invokes many possibilities for using this layout and variations of it for other Marketplace topics, which is what I will actually use it for. I’ve actually been working on a photo marketplace site for someone, so this is very timely for me. Even so, there’s a lot more that goes into selling photos online: subscription management, downloads management, etc. That’s the hard part! Having these layouts gives me a jumpstart in the right direction, so I can focus on the business processes (which I’ve spent countless hours on). Finding the right membership tool to manage subscriptions and downloads that doesn’t break the bank is my current challenge. I’m considering how I should setup and control photo access by membership level. It sounds easy to say free members get one download a month, bronze members 10 downloads, etc., but that’s a lot harder to do in practice. My current store sells images individually as WooCommerce virtual products. It’s looking like I’ll have to pay a lot of money for WooCommerce plugins to go to subscriptions, or redesign from scratch to do memberships. Thank you ET for reducing my effort on the design side with this layouts pack so I can devote my efforts to the business side. Hi Melinda, do you have any suggestion on which tools to use for the membership management both for clients and for the sellers? Thank you. hello.! How do I make the photo gallery for each category? How to make it works ? Should I install woocommerce ? and wc vendors?